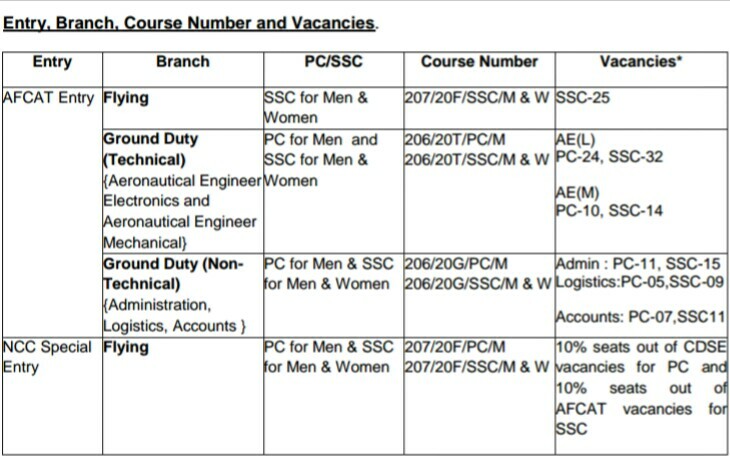 AIR FORCE COMMON ADMISSION ONLINE TEST (AFCAT- 01/2019) FOR FLYING BRANCH AND GROUND DUTIES (TECHNICAL AND NON-TECHNICAL)/ NCC SPECIAL ENTRY FOR COURSES COMMENCING IN JANUARY.... (From Official Advertisement). Indian Air Force Invites Both Men & Women, To Join The Elite Force As A Group A Gazetted Officer In Flying & Ground Duty. So Interested Candidates Kindly Register Yourself Within 30th Of December, 2018. Please Do Read The Notification Below For More Details & Informations. Ground Duty (Technical & Non Technical). Total Number Of Vacancies →163 Online Vacancies. Age Limit→ For Flying Branch 20 Years To 24 Years As On 1st January, 2020 & For Ground Duty 20 Years To 26 Years As On 1st Januray, 2018. Educational Qualifications →Kindly Follow The Notification/Advertisement For This. Online Application/Examination Fee →₹250, Online Payment Mode. Examination Date →16th & 17th Of February, 2019. Admit Card Download →For AFCAT Admit Card Download, Enter Their Official Site Down Below. Result →To Check Out The AFCAT Result, Visit Official Website Here>Official Website. So The Link Is Given Below For AFCAT 2018 Apply Online . Or Click Link 2 Below. Thank You For Visiting & All The Best And Do Visit Here Regularly For Latest Government Jobs News Alerts, Till Then Stay Safe And Blessed.